James Brown commonly referred to as "The Godfather of Soul", was an American entertainer recognized as one of the most influential figures in 20th-century popular music. As a prolific singer, songwriter, bandleader, and record producer, Brown was a seminal force in the evolution of gospel and rhythm and blues into soul and funk. He left his mark on numerous other musical genres, including rock, jazz, reggae, disco, dance and electronic music, afrobeat, and hip hop music. 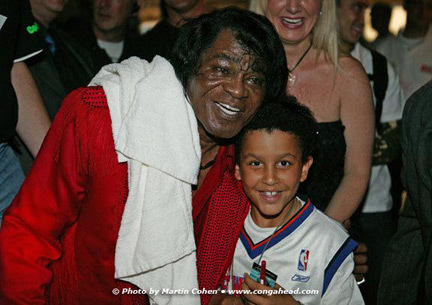 My life in music would not have been complete if I had not been able to see James Brown live at the North Sea Jazz Festival in 2005 and at BB King’s in NYC in 2006. At North Sea he was kind enough to give my son, Matthew an autograph and a few words of advice before heading to his dressing room after an exhausting show. His words were "Stay In School". Please CLICK HERE to see a gallery of photos.